“So, it's a well-designed, well-built case, but there are plenty of those on the market. What makes the Deep Silence 1 stand out from the crowd is the price. Even with an extra tenner for the white version, it's a lot of case for the money. Nanoxia's first chassis isn't quite perfect, but it's really rather good." “The feature set is very good just on the basic levels. I mean you have room for everything you could want in the PC, native USB 3.0, fan filters, sound absorbing materials. It is even water cooling ready and offers fan controls. That leaves users wanting very little. The Deep Silence 1 PC case from Nanoxia offers the perfect combination of great system cooling at extremely low noise levels. 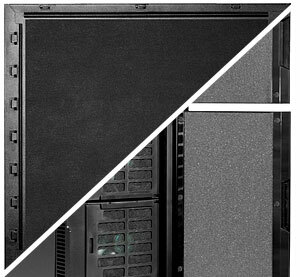 It includes many unique new features like the Air Chimney, retractable I/O panel and fully modular HDD bays. 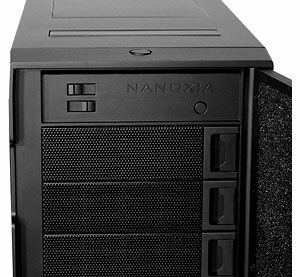 After their successful launch of their legendary Nano-Bearing fans, Nanoxia dedicated themselves to the development of high-quality must-have products and the Nanoxia Deep Silence 1 PC Case is no exception. This innovative tower case is the foundation for a whole new line of future products which offer the perfect combination of ideal system cooling and sensationally low noise levels, especially for use with high-end PC systems. The exquisite looks and timeless elegance characterise its appearance and yet the Deep Silence 1 is deliberately simple in design. Common controls have been inconspicuously integrated into the exterior surface, maintaining the simple clean exterior design of the case. In the course of the many years of development work which culminated in the Deep Silence 1, the focus was always on two requirements: minimal noise and system temperatures. Substantial effort was invested to minimise the noise levels. The side panels and top cover are fitted with specially designed noise reducing materials to minimise and absorb any noises. The solid front doors use sound absorbing materials to contribute significantly to the most effective noise reduction achieved by the Deep Silence 1. 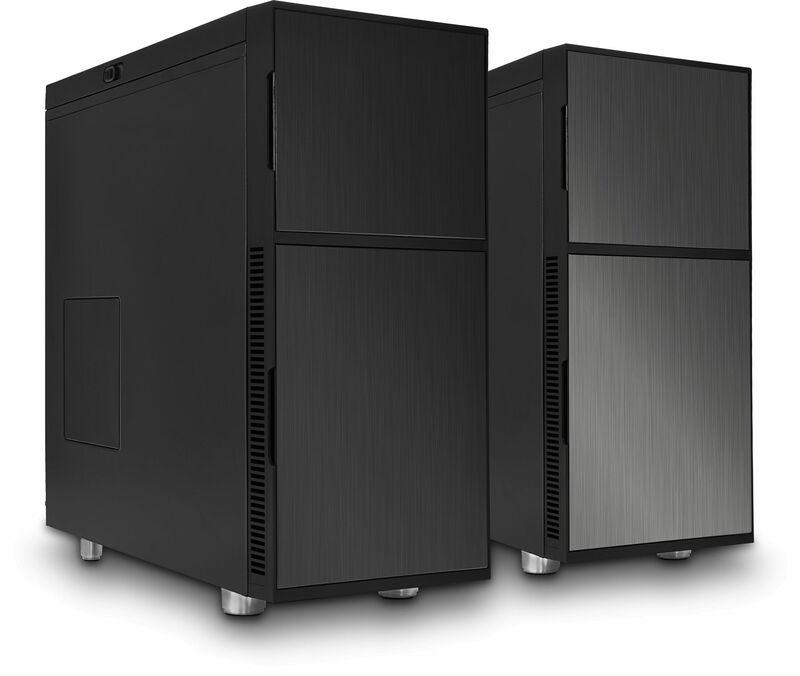 A unique feature of the Deep Silence 1 case is the Nanoxia Air Chimney in the top cover. 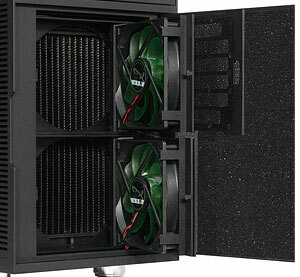 It can be used to increase the cooling capacity of the case with minimal increase in noise. This is accomplished by simply moving the slider on the side of the case to open it. Thanks to the stack effect (heated air always rises), system heat escapes passively and without additional noise from the case interior. 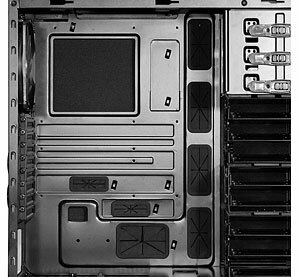 In order to mount up to eight 2.5" or 3.5" hard disk drives, three fully modular HDD cages are provided. Two of these cages are designed for three HDDs and the third holds up to two. In the interests of allowing as much personalisation as possible, the three HDD cages can be removed and combined as desired. This way it is possible to accommodate two, three, five, six, or eight data storage drives in the Deep Silence 1. Alternatively, you can mount the hard drive cages for two or three drives towards the power supply. Please note that this configuration no longer permits a fan assembly on the bottom of the case and the maximum depth of the power supply cannot exceed 200 mm. Due to this unique versatility, the installation of longer graphics cards is possible up to an incredible maximum length of 445 mm. Even if two HDD cages are removed, at least five assembly bays for HDDs remain. When using all of the HDD cages, the maximum length of VGA cards is 315 mm. By removing unneeded HDD cages, the front fans can increase cooling of graphics cards. Behind the top door there is an integrated fan control that can manage up to six fans, allowing the user to optimise fan speeds to balance system temperature against noise levels. Three high-quality Nanoxia Deep Silence fans are pre-installed in the case. Behind the front cover, two 120 mm fans rotate at a maximum of 1300 RPM. The fans are located in special swivelling brackets which allow simple removal of the fans and easy access to their dust filters. At 14.2 dB(a), the Nanoxia Deep Silence 120 mm fans generate an airflow of 60.1 CFM and a static air pressure of 1.27 mm H2O. Mounted at the back of the case is a 140 mm fan rotating at roughly 1100 RPM while generating an airflow of 68.5 CFM and a static pressure of 1.08 mm H2O at a noise level of 14.4 dB(a). Due to the generous width of the Deep Silence 1, it can accommodate CPU coolers up to 185mm tall meaning virtually any CPU cooler currently available will be compatible. The I/O panel can be found on the top cover of the case with 2 x USB 3.0, 2 x USB 2.0, Mic and Headphone connectors available. The panel can easily be embedded in the cover if the connectors are not needed. This ensures that the simple look of the case is maintained without sacrificing useful features. The Nanoxia Deep Silence 1 offers a lavish cable management system. All openings in the motherboard tray are fitted with rubber chafe guards. 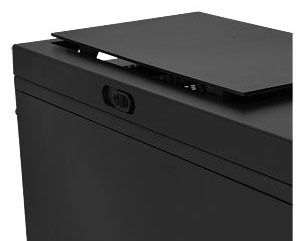 Even when using Micro-ATX motherboards it is possible to hide cables behind the motherboard tray. Of particular interest for water cooling enthusiasts is the ability to accommodate a 240 mm radiator below the steel cover. Compact water cooling solutions can be mounted under the top cover as well. If the HDD cages are arranged in a certain way, another 240 mm radiator can be fitted at the front of the case behind the front 120 mm fans. 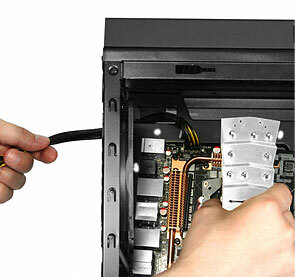 Depending on the motherboard standard, the additional mounting frame can be used to accommodate two or three HDDs. It supports all mainstream radiators with 15mm spacing. The quietest PC I have ever had. 'Silence' in the description is a little misleading - this case is very quiet but not silent. However, the fan noise is not at all intrusive even running Flightsim X with VFR scenery at fairly extreme settings (my system Intel i7 3.6 GHz, 12 Gb 1600 MHz DDR ram, AMD 7870 graphics, 3x HDD), the case is very well built, monitored components rarely get above 50 C, there is a lot of room inside.... I could go on for ever but at this price point it can only get 5 stars! Also, Quietpc.com continue with their legendary standard setting service. Fancied a change from my CM Stacker and liked the look of this one. Researched it thoroughly and thought it was good value for £100, then I saw Quiet PC had it for £75! Bargain. Plenty of room inside despite only being a Mid Tower, lots of configuration options, good cable tiding features (I've never had a computer look so neat internally) and it has a chimney! To be honest, I'm not sure of the merit of an air vent but it's there anyway.